Every detail of an earth-shaking performance can’t be sloppy at all. That is why DJAV is created. All of the soft wares and hard wares have passed through the strict testing in our warehouse to make sure no mistake existed. In other words, it is the highest level of an innovation towards speakers. Let’s take a look at hard wares. 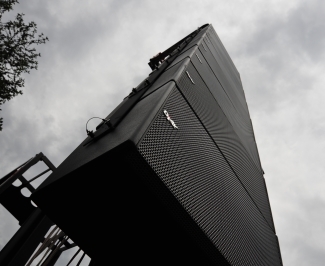 First is the sound box, which has the subwoofer built-in and is the latest concept product of 707 line array. In addition, our new Line Array products detach the subwoofer as compared to other designs which contains large drivers with double units to conduct long-distance transmission. The difference between our brand products and European and American brand products is that they are at a malfunction situation. Meaning, the imperfect design leads to the consumer’s confusion when using the speaker. At the end of a concert the speakers leave no distinguished feelings to consumers and to those who listen, therefore a likely discussion about how the sound effects are not as good as hoped will occur. With 707 landing in Shanghai, people will get to know what the real effect of a music festival is, what a balanced sound is, what a clear sound is, and what a dynamic sound is. There are many concepts that should be re-recognized to everyone and those are our main goals. We acknowledge and enhance, to the right amount, the beautiful sounds just the same as when a show performs during "Passionate Night". Beautiful sound does not need to be excessively exaggerated, all it needs is the right tools. Almost all the related equipment's are transported to Shanghai from abroad, including latest Audio Mixing Console 2416. The equipment has a great capacity to provide 24 remixes and 16 output matrix. The appearance of this Audio Mixing Console adds onto the astonishing equipment. Even the evening concert will present the digital technology on the Acoustic Field, which will be a party of the latest digital technology! In the U.S a well known microphone used is by a brand name SHURE. Traditional wireless microphone SHURE 58 can’t provide gorgeous alto and treble. Modern Sennheiser also can’t provide low frequency dynamics. So how can we put alto, treble, and dynamics together? DjAV’s Digital Dynamic Processor can solve this perfectly. All the wireless microphones are elaborately made by DjAV, and through Digital Dynamic Processor, these microphones can capture the user’s every musical detail. A power supply cabinet, especially made for performances, will establish a strong basis for the steady work of the whole system. Three independent power supply cabinets can supply a total power of 60 KW, which provides a steady power for the entire evening concert. A safe and stabilized power comes before everything! All of the needed auxiliary equipment's will be at the scene, such as antenna amplifier, remote signal controller and multi-functional digital processor. We will use WIFI to monitor the power amplifier and the working status of sound boxes, and we will use an Ipad to process remote musical signals. All in all, DjAV adopts the latest inventions and the most advanced digital technologies to perform any music event. We are here to create history! It is the time to eradicate the malfunction effects of domestic performance. With the hardware, the software is more worthy of praise. DjAV has been accumulating large stage performances ever since 20 years ago. DjAV has participated performances in Hong Kong and participated in Taiwan stars in the past. It has an excellent experience in communicating with the organizers of activities and in interacting with the performers! Although DjAV gets the notice to participate the activity late in time the experience makes up everything, and also makes everything come true. Most equipment's of this activity are transported from US to Shanghai. Without considering the expenditure these ordered equipment's will appear before your feet in such a short time, which is an impossible mission for any other company. As the saying goes, "even a hero needs someone's help", DjAV has many people to thank for in the years of participating in this line of work, which include every supporters from US to China. The company shall present special thanks to the sponsors of this conference, “Broad Automobile Park”, Creative Executive “Ying Xiang Media”, Stage Director Brother Feng, the technology team from DjAV, and the distinguished work accomplished by C-MARK(Shanghai)’s staff, as well as the support from buyers from all over the country. It is a successful night that we will face in a unique shock that has never been seen before.